Airbags are bags made of synthetic fabric that are behind the surfaces of the interiors of cars. The bags rapidly inflate and then deflate upon sudden impact or fast deceleration, creating a cushion. They are not visible from the passengers’ perspective until they inflate. Most cars today have a driver seat airbag (located inside the steering wheel) and a front passenger seat airbag. 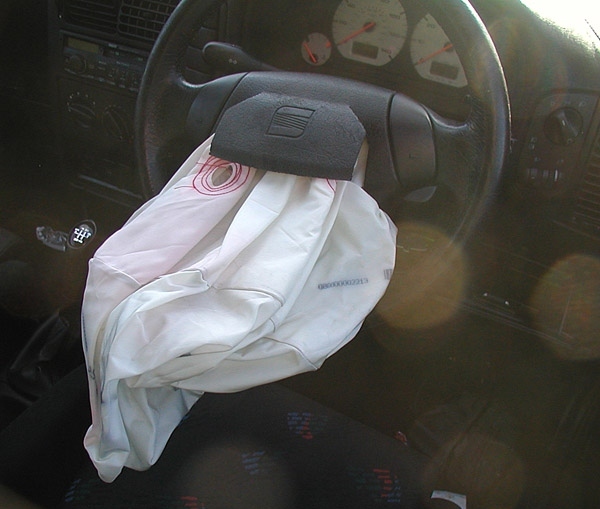 Other possible locations for airbag modules, which consist of the inflatable bag and the means to inflate it, are the side curtain and the seatbelt. The widespread introduction of airbags in the 1990s has made driving much safer. Air bags really can save lives, but only if they are properly maintained. An airbag is designed to inflate only once. Any car that is involved in an accident serious enough to inflate an airbag will need major repairs, anyway. If one of your car’s airbags has inflated or if you buy a used car in which one of the airbags has inflated, it is important to replace the airbag module. Even if the airbags in your car have never inflated, it is important to check them to make sure that they will inflate when needed and will not inflate when not needed. Unwanted inflation of airbags can cause serious injury, and if an airbag inflates while the car is moving, it obstructs the driver’s view of the road. Even when airbags inflate properly and at the right time, they are designed to protect adults and not children, which is the reason behind the laws specifying a minimum age requirement for children to ride in the front seat. The airbag module is a computerized system that controls when the airbag inflates and deflates. It is connected to the car’s seat belts, impact sensors, and airbags. A minor collision sends a strong enough signal to the impact sensor to send a signal to the airbag module to illuminate the “check airbag” light. If your car’s “check airbag” light has turned on after a minor accident, you should bring your car to us for service. We can reset your airbag module so that you can be sure that your airbag will inflate when you need it but will not inflate at any other time. Elkhart Mechanics is a full service garage that can take care of all your auto maintenance and repair needs, including those related to airbags. Many cars have a “check airbag” light; bring your car to us if your car’s “check airbag” light is illuminated, and we will find and solve the problem. If your car’s airbags are defective or expired (most airbags are guaranteed to last 14 years), we can replace them and install new airbag modules. If your car only has driver seat and front passenger seat airbags, we can install additional ones, such as curtain modules. Our mechanics have the training necessary to deal with airbags and the mechanisms that operate them. We will never overcharge you or talk you into unnecessary repairs or make them without agreeing with you first.